Scrapple is typically made of hog offal, such as the head, heart, liver, and other trimmings, which are boiled with any bones attached (often the entire head), to make a broth. Once cooked, bones and fat are removed, the meat is reserved, and (dry) cornmeal is boiled in the broth to make a mush. The meat, finely minced, is returned to the pot and seasonings, typically sage, thyme, savory, black pepper, and others are added. The mush is formed into loaves and allowed to cool thoroughly until set. The proportions and seasoning are very much a matter of the region and the cook's taste. A few manufacturers have introduced beef and turkey varieties and color the loaf to retain the traditional coloration derived from the original pork liver base. Due to its composition, it is often jokingly described as being made from "everything but the oink". Scrapple is typically cut into quarter-inch to three-quarter-inch slices and pan-fried until brown to form a crust. It is sometimes first coated with flour. It may be fried in butter or oil and is sometimes deep-fried. Scrapple can also be broiled; this is a good cooking method for those who like their scrapple crisp. 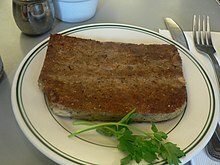 Scrapple is usually eaten as a breakfast side dish. It can be served plain or with either sweet or savory condiments: apple butter, ketchup, jelly, maple syrup, honey, or mustard. The roots of the culinary traditions that led to the development of scrapple in America have been traced back to pre-Roman Europe. The more immediate culinary ancestor of scrapple was the Low German dish called panhas, which was adapted to make use of locally available ingredients, and it is still called "Pannhaas," "panhoss," "ponhoss," or "pannhas" in parts of Pennsylvania. The first recipes were created by German colonists who settled near Philadelphia and Chester County, Pennsylvania in the 17th and 18th centuries. As a result, scrapple is strongly associated with areas surrounding Philadelphia, Baltimore, Washington, D.C.; Eastern Pennsylvania, New Jersey, Maryland, Delaware, Southern New York, and the Delmarva Peninsula. Its popularity on the Delmarva Peninsula is celebrated the second weekend of October during the annual "Apple Scrapple Festival" in Bridgeville, Delaware. The two largest brands of scrapple in Philadelphia are Habbersett and Rapa controlling approximately half and a quarter of the market respectively. ^ Pennsylvania Folklife 22. Pennsylvania Dutch Folklore Center. 1972. Retrieved 2014-05-30. ^ Food in Colonial and Federal America. Greenwood Publishing Group, 2005. 2005. ISBN 9780313329883. Retrieved 2014-05-30. ^ "Scrapple Recipe". Food Network. Retrieved 2011-04-10. ^ "About.com, PA and NJ Regional Recipes. Scrapple Recipes". Philadelphia.about.com. 2009-08-20. Archived from the original on 2011-07-07. Retrieved 2011-04-10. ^ "Rappa Scrapple, Beef". Rapascrapple.com. Archived from the original on 2009-02-13. Retrieved 2011-04-10. ^ Talorico, Patricia (May 21, 2014). "Scrapple – love or loathe the loaf". The News Journal. Retrieved July 9, 2018. ^ Jalowitz, Alan (Spring 2013). "Scrapple: Pennsylvania's "Other" Meatloaf". Retrieved July 9, 2018 – via psu.edu. Scrapple is but one of the many varieties of dishes that arose from the need for the poorer classes in society to use as much of their butchered hogs as possible. This frugality has given more than one wag cause to refer to scrapple as "everything but the oink." ^ Weaver, William Roys (2003). Country Scrapple: An American Tradition. Stackpole Books. p. 8. ISBN 978-0-8117-0064-1. ^ "Definition of "pannhas"". Dictionary.reference.com. Random House Unabridged Dictionary. 2006. Retrieved 2011-04-10. ^ "HistoryScrapple, Liverwurst and Smoked Meat Products | Habbersett | Habbersett Scrapple". www.habbersettscrapple.com. Retrieved 2018-11-11. ^ Amy Strauss (9 October 2017). Pennsylvania Scrapple: A Delectable History. Arcadia Publishing Incorporated. pp. 30–. ISBN 978-1-4396-6298-4. ^ Pollard, Kit Waskom (24 January 2018). "Unpacking scrapple: How a loaf made from pig scraps became Baltimore's favorite breakfast meat". baltimoresun.com. Retrieved 15 December 2018.